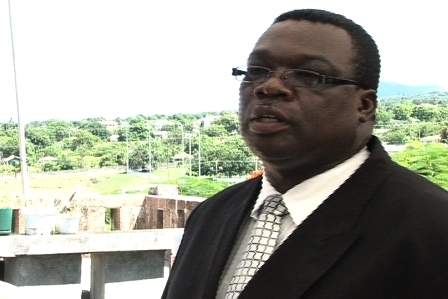 CHARLESTOWN NEVIS (September 22, 2010) — Premier of Nevis and Minister responsible for Security Hon. Joseph Parry had words of praise officers of the Royal St. Christopher and Nevis Police Force stationed in the Nevis Police Division for their tireless work to fight crime on Nevis. 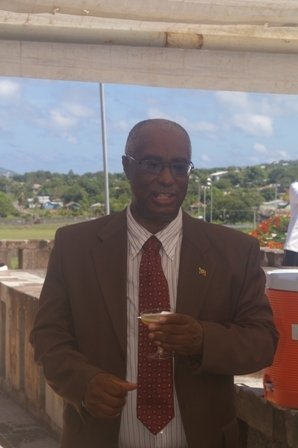 Mr. Parry’s commendation came on Monday after the 27th Anniversary of Independence Day Parade at a brief ceremony to toast the Police and the nation of St. Kitts and Nevis at Bath Hotel. “Officers you have done an outstanding job and I want you to continue to do your job seriously, diligently and in the interest of the nation,” he said. 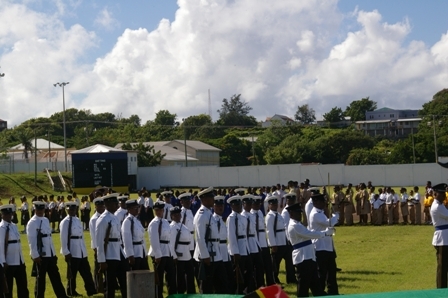 The Premier told the small gathering of other armed forces and government officials including Deputy Governor General His Honour Eustace John, that the public should understand that the men and women of the Nevis Police Division were important to Nevis and had been giving of their best to curb crime. He said the Nevis Island Administration (NIA) had done much for the officers and assured of the Administration’s continued assistance. However, Mr. Parry noted that the government was seeking to establish a partnership with the police but called for a reciprocal partnership from the police with the community. Notwithstanding, Mr. Parry explained that it was equally important for the public on Nevis to partner with the police in the interest of the island’s continued development. “We need to understand that these men are important to us and they are doing their best. We have done so much for them and we will continue to do but what we need and what we are trying to establish as a government is a partnership with the police and we want the police in turn to have a partnership with the community and it cannot be a one sided partnership. “The police cannot be totally effective if they have no information. They cannot be totally effective if the community is not cooperating with them…if people are doing crime they are hurting the country and they are helping to destroy the country make sure that they are reported,” he said. Meantime, when was called upon to raise a toast to the ranks of the Royal St. Christopher and Nevis Police Force, Divisional Commander Mr. Hilroy Brandy thanked the Federal Government and the NIA for their worthy assistance in the past year. He said it was important for the people of St. Kitts and Nevis to know that the Police in the Nevis Division and the entire police force viewed them both, as partners who deserved their concerns, care and attention. “We are truly committed to reducing the fear of crime in our community and we endeavour to do this by creating a partnership in our neighbourhood. As a nation we must remember that community safety is everyone’s responsibility and crime prevention/detection is everyone’s business,” he said. The Nevis Division Commander also had words of commendation for the ranks in the Division for the fortitude and patience they had exhibited during the year. He told them their hard work and dedication had been overwhelming, in particular over the past five weeks. “You have demonstrated that commitment when quite recently robberies and breakings intended to cripple our society. You have worked long and hard. You stood firm despite the negative criticisms. Today I can say we have done well in solving over 95 percent of those crimes for the period mentioned,” he said. Mr. Brandy further told the Officers that it behoved them all to combine their efforts to effect change in the society. He impressed upon the community the need to be a brother’s keeper and they should report crime if they saw something. “We cannot do it alone. Do not be dismayed by a few misguided youths whose desire is to destroy our country. Please assist us,” he urged in conclusion.